The DFL is getting its money’s worth. After the Strib, MPR and the MinnPost ran pieces that called (on rather specious grounds) for Tom Emmer to release his plan for re-engineering state government, the regional sorosphere is taking up the chanting point. That’s how the DFL machine works. Why Should Emmer Do The DFL’s Work For Them? : The DFL not only have seven weeks to go until their primary, but the DFL seems to be mired in a huge passion deficit. Nobody cares about the DFL primary race. Mark Dayton isn’t so much running away as ambling away with it – because it’s the most tedious primary field in Minnesota history, and its finish is all but inevitable at this point: Mark Dayton is going to win, and nobody in the world outside the DFL cares about Margaret Anderson-Kelliher and the other guy. So the DFL desperately wants Emmer to give them some red meat on which the three “contenders” can focus. Which is why you see the articles, and the vigorous chanting from the blogs; because if the DFL doesn’t get something interesting to talk about soon, their primary turnout may be lower than Bert Blyleven’s lifetime ERA. The DFL realizes that they’re facing a Republican “passion index” that is beyond anything in recent memory – it may dwarf 1994 by the time we’re done – and they have to do something to focus the troops. So expect more “Heyyyy, what are you, chicken? 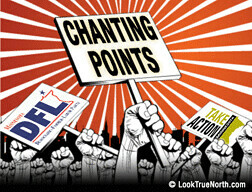 Buk buk buk!”-style chanting from the DFL, their media supporters, and the chantblogs. And do not expect Emmer to take the bait! The Endurance Race: Campaigns are like a competitive 10K race. It’s a long slog – and you still need to have a sprint-like “kick” at the end. And in a long race, runners will try to trick other runners into using their “kick” early, tiring themselves out, and fading in the stretch. …but you only have one kick. And if Dieter jinks you into blowing your kick too early in the race, it’s all over. …but only once. It’s for the end of the race. When it matters. The DFL, of course, would love it if Emmer used his kick right now, while Dieter and the other three runners from Bulgaria, Singapore and Tuvalu were still getting into the starting blocks. Look – Emmer’s up against not just the DFL, but the media and, by election-time, most likely plenty of national liberal donors and activist groups. It’s a tough uphill battle in this state; the Strib and MPR have immense influence on voters, and the Strib (and the MinnPost, which is largely former Stribbers) is nothing if not reliably in the bag for the DFL. Emmer has ever reason to husband his resources, his “kick” – money, ad time, volunteer energy, impact – for when they matter. So when your co-workers come out with that time, put ’em in place. It’s getting old. Hey, anyone see the PBS special on TV Monday night? It was called the “military-Industrial Complex”. Thought I’d catch part of it. Hmmmm the highlight seemed to be when PBS/Minnesota Public Television/Taxpayer funded made the assertion that the Japanese were trying to surrendur in July of 1945, but Truman rufused to accept their unconditional surrendure because he wanted to drop atomic bombs on Japan. So, your reasoning here Mitch is that it is better for Emmer to play politics, than to begin to engage the voters? Because those dumb voters are too stupid to take into account how political campaigns operate, and to appreciate someone who is issue oriented rather than political gamesmanship oriented? If Emmer put issues first, even if I disagreed with his positions I might vote for him, just because it would be so darn refreshing, and honest, and issue-oriented. Not to mention, outside-the-box and because-we-have-always-done-it-that-way thinking. Yeah, that looks like spin to me. No, DG. my reasoning is above. Also Emmer’s. Also Dayton and Kelliher’s. Entenza and Horner are going into more details, because they have nothing to lose. Yeah, that’s entirely your projection, and given that it completely ignores the real reason, which I spell out well enough above that I’ve gotten more buzz on both sides of the aisle – the Emmer campaign and the media and in between – than anything I’ve written lately – it’s really a tangent. But more on that below. Idealism – “the voters will hear my idea and carry me to St. Paul on their shoulders” – sure is fun, but politics ain’t bean bag. Ask yourself (you haven’t, have you?) why Mark Dayton is even more vague about his plans than Emmer is, but nobody seems to be writing columns about it? Maybe, but you’re not really the target. The target IS the mass of independents that DO swing elections in this state, and as a matter of absolute fact DO NOT make political decisions until the week before the election, and DO traditionally make those decisions on mundanities like name recognition, first impressions, and occasionally – this year is a great example – huge overriding issues like anger at huge government. Those are not theories I’m tossing out from the top of my head; those are absolute immutable facts of on-the-ground campaigning. They do this not out of stupidity – far from it – but because that’s they way they approach politics. Your wishing does not change it. And the DFL and media both know this. Well, that’s great, but when Bucky and Jill in Alexandria, and Lee and Sherri in Mankato make their decision for whom (and whether) to vote, stats show that if they’re not part of the 30-odd-percent that strongly identify with both the GOP and the DFL, it’ll be made after October 1, and it’ll be made disproportionally due to images they get from the Strib, WCCO, MPR and local media (and, on the conservative side, talk radio). And the Strib and WCCO and most of the other mainstream media will be doing what they can to undercut Emmer, and Emmer’s big shot to beat that is to bypass the media and – as I quite correctly note above – that’s something for which a campaign needs to keep its powder dry. And, again, everyone knows it. And, again, there’s a reason that those players are asking Emmer, but not Dayton, for specifics. And if you ignore any of those absolute, immutable facts, then you either have a lot to learn about on-the-ground campaigning, or you are being obtuse to the point of tendentious. Of course it does. But there was never any doubt about that, was there? That’s no surprise since we have no doubt that through her eyes, the room deegee is sitting in is revolving at 20 RPM. There you go again, DogPrescottPile. Being p0wn3d on all other threads, you simply move your chanting points over to the next. Why is it that you hold GOP Emmer nominee to a different standard then DFL wannabees. Is it because you concede that Emmer is worth three madlibs? Why should he engage in an unfair fight? Hehe — those MinnPost commenters are long on criticism, but extremely short on how that criticism relates to the content. I suppose if you can’t actually address the content in a meaningful way, mentioning it could get dicey. Though I do most times disagree with her, at least Dog Gone gives it a go, and I appreciate that. The candidates should be focusing on doing what they need to do to win the primary election. If the candidates have similar views then I would like to see detailed proposals at least a month before the election. So when will Mark, Matt, and MAK release their detailed plans? Pingback: Shot in the Dark » Blog Archive » How The Hell Does Emmer Win This Thing? Pingback: Shot in the Dark » Blog Archive » Media: AWOL! Day One!